Tanna of the third generation. In Ab. R. N. xxix. mention is made of an Abba Saul b. Nanos whom Lewy ("Ueber Einige Fragmente aus der Mischnah des Abba Saul," in "Berichte über die Hochschule für die Wissenschaft des Judenthums in Berlin," 1876) regards as identical with the Abba Saul of this article. The Abba Saul bar Nash mentioned in Niddah 25b is probably likewise identical with him. As Abba Saul explicitly refers, in Tosef., Sanh. xii., to an opinion of R. Akiba's, and, in Tosef., Kil. iv. and Oh. vi., to disagreements between the latter and Ben 'Azzai, as well as between Akiba and the ḥakamim, it may be concluded that he was a pupil of R. Akiba and that he lived in the middle of the second century C.E. The reference to "bet Rabbi" in Pes. 34a, where Abba Saul is said to have prepared the bread according to Levitical rules of purity in "Rabbi's" house, must be construed as referring to the house of the patriarch R. Simeon b. Gamaliel II., not to that of R. Judah ha-Nasi I. (comp. Lewy, l.c. p. 21, and note 42). 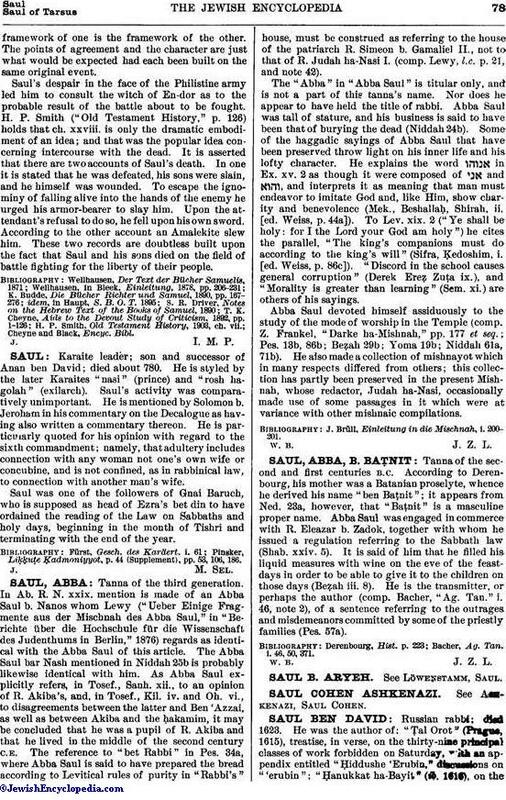 The "Abba" in "Abba Saul" is titular only, and is not a part of this tanna's name. Nor does he appear to have held the title of rabbi. Abba Saul was tall of stature, and his business is said to have been that of burying the dead (Niddah 24b). Some of the haggadic sayings of Abba Saul that have been preserved throw light on his inner life and his lofty character. He explains the word in Ex. xv. 2 as though it were composed of and , and interprets it as meaning that man must endeavor to imitate God and, like Him, show charity and benevolence (Mek., Beshallaḥ, Shirah, ii. [ed. Weiss, p. 44a]). To Lev. xix. 2 ("Ye shall be holy: for I the Lord your God am holy") he cites the parallel, "The king's companions must do according to the king's will" (Sifra, Ḳedoshim, i. [ed. Weiss, p. 86c]). "Discord in the school causes general corruption" (Derek Ereẓ, Zuṭa ix. ), and "Morality is greater than learning" (Sem. xi.) are others of his sayings. Abba Saul devoted himself assiduously to the study of the mode of worship in the Temple (comp. Z. Frankel, "Darke ha-Mishnah," pp. 177 et seq. ; Pes. 13b, 86b; Beẓah 29b; Yoma 19b; Niddah 61a, 71b). He also made a collection of mishnayot which in many respects differed from others; this collection has partly been preserved in the present Mishnah, whose redactor, Judah ha-Nasi, occasionally made use of some passages in it which were at variance with other mishnaic compilations. J. Brüll, Einleitung in die Mischnah, i. 200-201.